Saturday- We left and went downtown early to the Farmers Market. 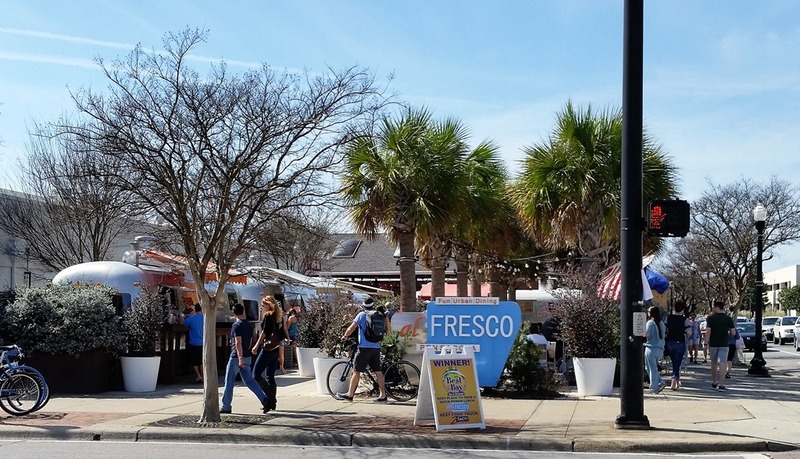 They have a nice market, which is 4 blocks long, on the median, in the center of a busy street. There was not a lot of produce there, as it is off season, but there were many vendors. There was bread and other bakery items ( we passed up on them), jewelry, hand made furniture, BBQ sauces, a mustard vendor ( we purchased a jar of Chocolate Cherry Mustard) from him, clothing vendors etc. 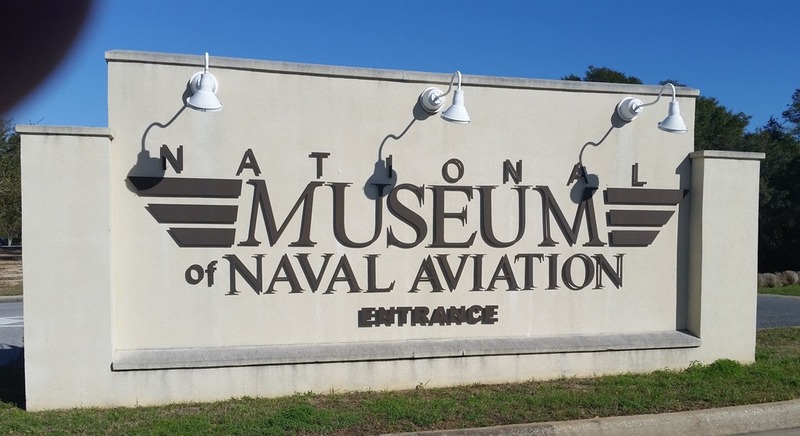 We returned to the MH for lunch, then Bob went to the National Museum of Naval Aviation. I had no interest, but Bob had worked for the Dept. 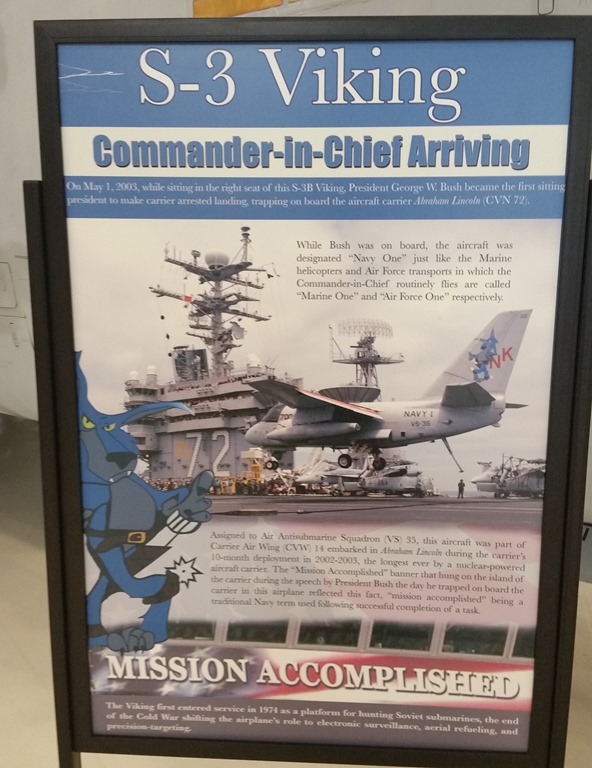 of the Navy, on many of these planes, so this was very interesting to him. This gave Bob an opportunity to spend as long as he wanted visiting the museum. I spent the afternoon doing laundry, reading and watching TV. Above is a F-18 A. Bob tested all of the escape systems in this plane! 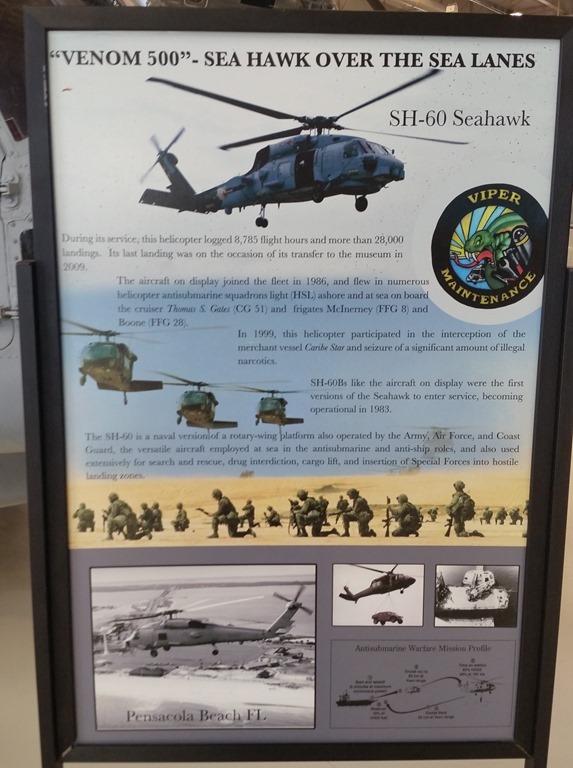 Bob worked on this model of helicopter. For those of our friends who know Dr. Roy Geisart, Chiropractor, he flew this plane! This was also the first plane that Bob worked on! Below is the plane that George HW Bush flew in WWII. 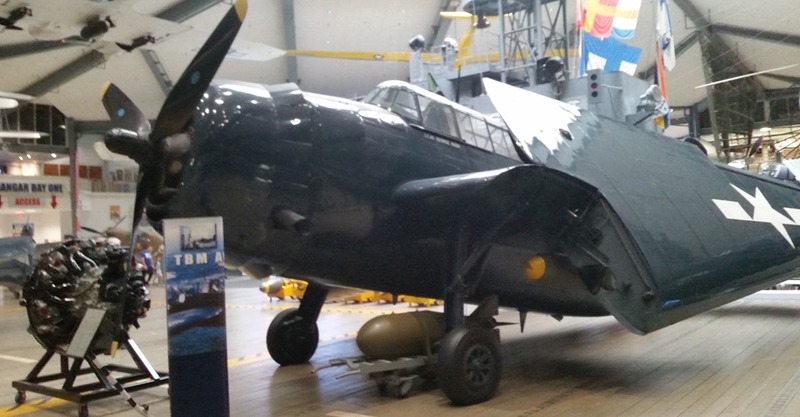 It is a TBM Avenger. Below is a F4 Corsair. A pilot by the name of Greg ( Pappy) Boyington was the Marine Top aviator who had 24 confirmed air to air victories in this plan during WWII. Below is a Stearman Trainer. Most of the Navy’s WWII pilots learned to fly in this plane. 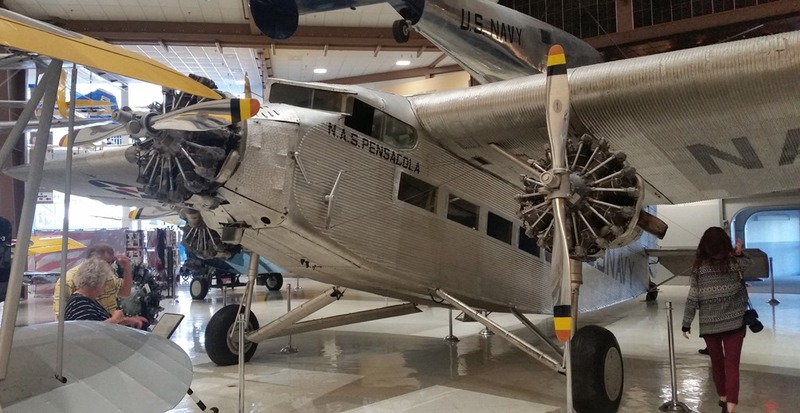 Below is a Ford Tri-motor plane. A classic pre-WWII passenger plane. 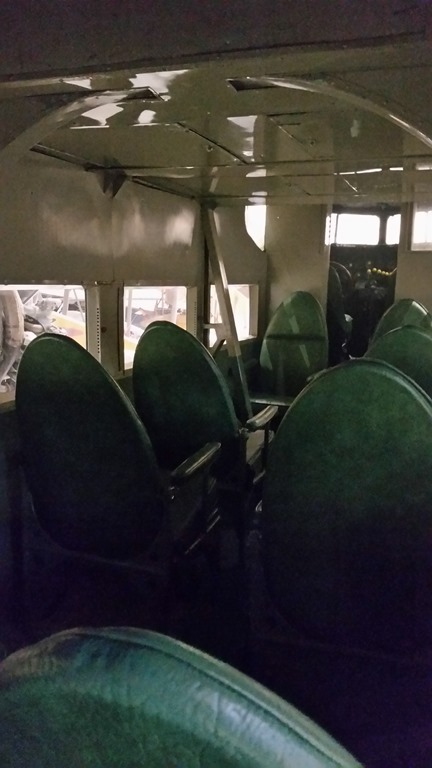 This is the inside of the Ford Tri-motor. He returned and we went out to dinner at The Oar House for a nice seafood dinner. Sunday- We packed up to leave. The base is the home of the Blue Angels, but they were not here this week. We hope to return at a time that they are here to practice. The field is across from the RV Park and you can go over and watch them. We left around 10, driving west on Hwy 98 to Hwy 59 north. We drove into the Escapees Rainbow Plantation RV park at a little after 11. It was a short drive, so we did not bother with hooking up the car. We settled into site 81, after hugs and greetings. We have FHU 50 amp, with satellite access for $19 per night. We had a quiet afternoon. We sat outside in the sun and shade, reading out books. We ate an early dinner, then went to the Clubhouse for the evening entertainment. It started with announcements, then they had a little comic show. That is Mighty Mouse on the right. Then they had an ice cream social, which butter pecan (very popular), chocolate,vanilla, and Tin Roof. After the ice cream, we went to the craft room to play Mexican Train. They have slightly different rules, which took us awhile to get used to! We played until 9:30 ,with Bob being in 6th place and me in 7th! Monday- Happy President’s Day! We left and went to the Post Office, as our mail is there. Hmmm, both of us forgot it was a holiday! We left and went back to Pensacola to meet up with my cousin Claire. We picked her up at her condo, and went to the Blue Wahoo Stadium. It was a nice minor league stadium with a really nice playground for the kiddies! It is located right on the bay. 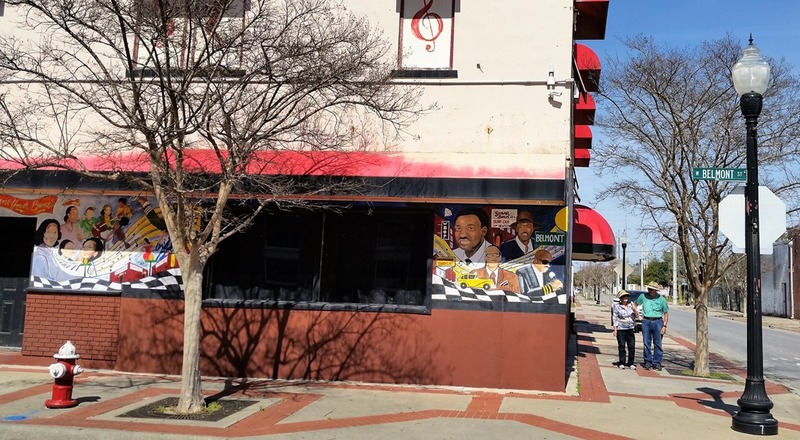 We left and went to the visit the historic African American neighborhood of Pensacola, which has been updated significantly. 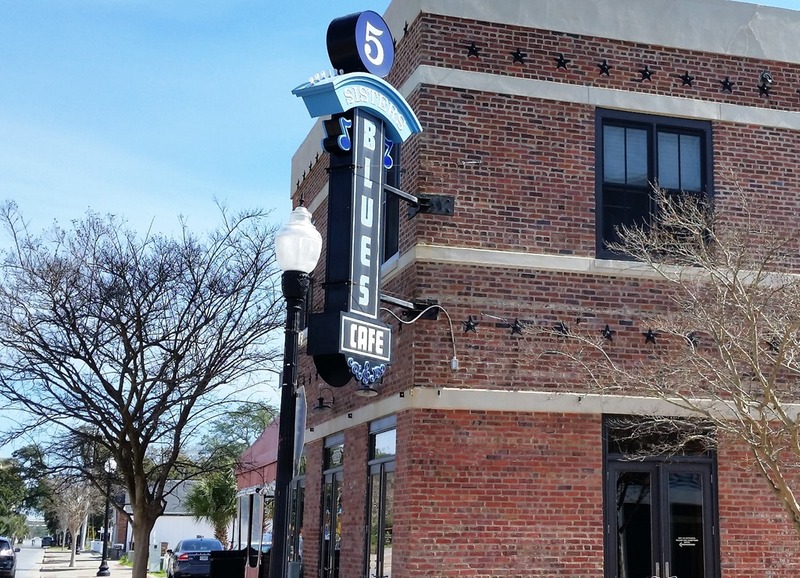 Here is the famous 5 Blues Sisters Café. We then left and went an art colony to look for an artist that Claire was trying to catch up with. We stopped for lunch at some Airstream trailers that are now lunch wagons. Since it was the holiday, the menu’s were limited, but we had a nice lunch. 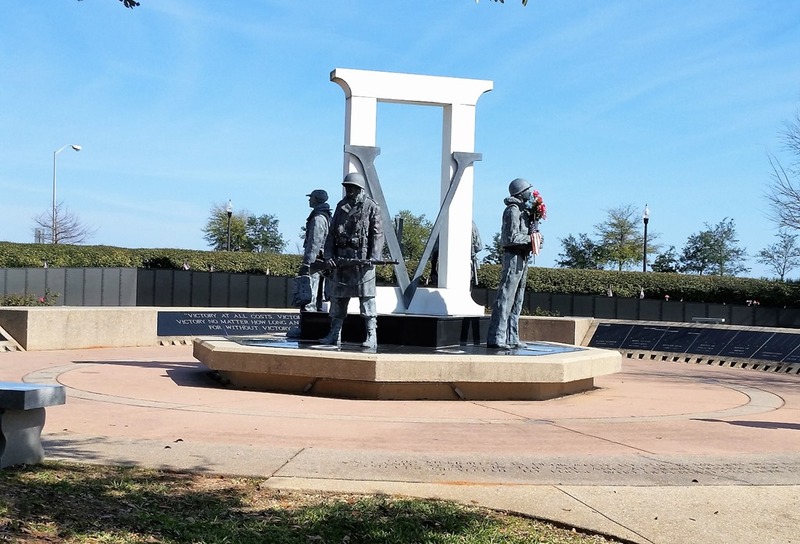 We continued our journey, stopping at the Veterans Memorial. There is a mini-wall, similar to the Vietnam Memorial, and some other memorials. We stopped at Baskin Robbins for some ice cream, then dropped Claire off at her condo, saying a fond good-bye until next time! We returned to the MH. stopping for gas, $2.03 / gal. We walked the dogs and did not feel like eating in, so we went to Lamperts Café for dinner. The food was good, but there was way too much of it! Tuesday- We did various tasks around the MH, then went to town for lunch at the Mellow Mushroom, for some awesome pizza.Excellent pizza! We returned to the MH, and went to the social hour at 4. We were not impressed, as the men were on one side of the room and the ladies on the other. We did stop in and speak with the cook, asking if there was any bell pepper in the dinner on Friday. No, so we signed up for the Friday evening dinner. We worked on taxes this afternoon. At 5:15 we returned for the dinner. We had a nice dinner. At 6:45, Bob started playing Mexican Train. I was waiting for Mahjong, but no one showed up, so I joined the Mexican Train. We played until a little past 9. Wednesday- I was out the door early, after starting a load of laundry. I went to Fairhope to get my hair done. I returned at about 11. We left and went to town, stopping at Grumpies for lunch. Then we continued on to Walmart to grocery shop. We returned to the MH and ordered our tags for the car ,as the are due the end of March. Then we worked on Doctor appointments in Phoenix and finished the taxes. We reviewed them and e-filed. We ate leftovers for dinner, and at 6:45 I went to the Clubhouse for Mahjongg. 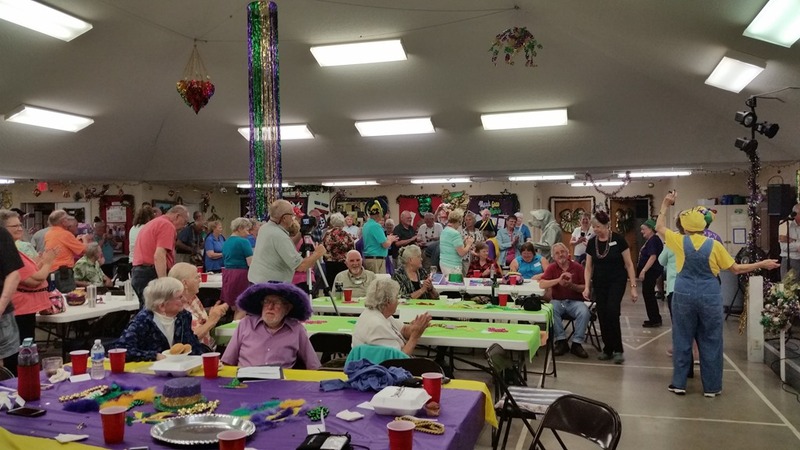 Oh well, the room was full of people working on the Mardi Gras activities. 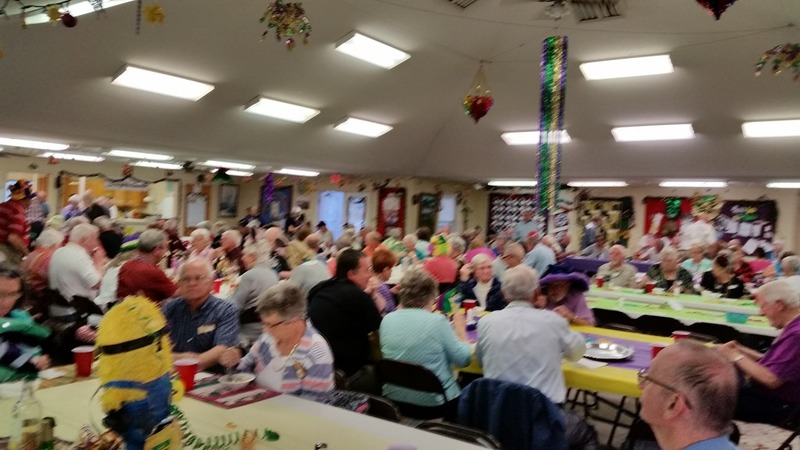 I always thought that Mardi Gras was just a New Orleans thing, but evidently, it is very big all over this area of the south. There are a lot of parades in the area. Thursday- We had a quiet morning around the MH. We went to lunch at the Fish River Restaurant. Then we went to my cousin, Gloria’s condo to play Quiddler. We also played Canadian Salad. We left after 5, and stopped at Panda Express for dinner. We continued on back to the MH and had a quiet evening. Friday- We worked around the MH in the morning, continuing trying to schedule doctors appointments and making reservations. We left around 11 and drove south and stopped for lunch at the famous Original Oyster House restaurant in Gulf Shores. 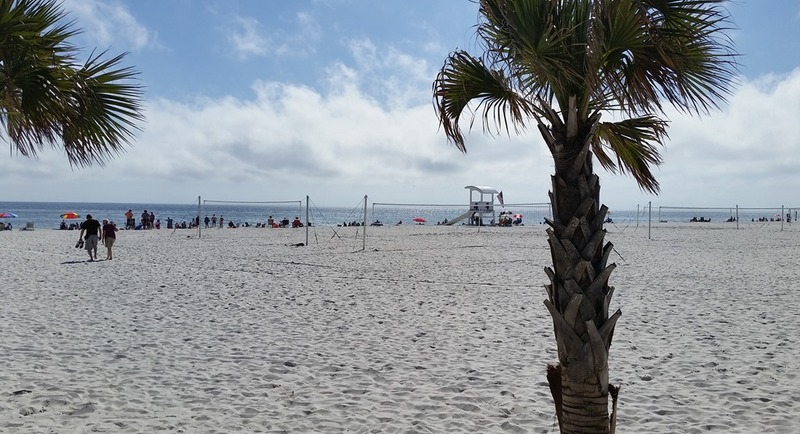 We traveled north along the Gulf to Orange Beach and returned to Gulf Shores to walk out to the beach. It was bright and sunny with temps in the high 60’s. We returned to the MH and went to dinner at the Club House. 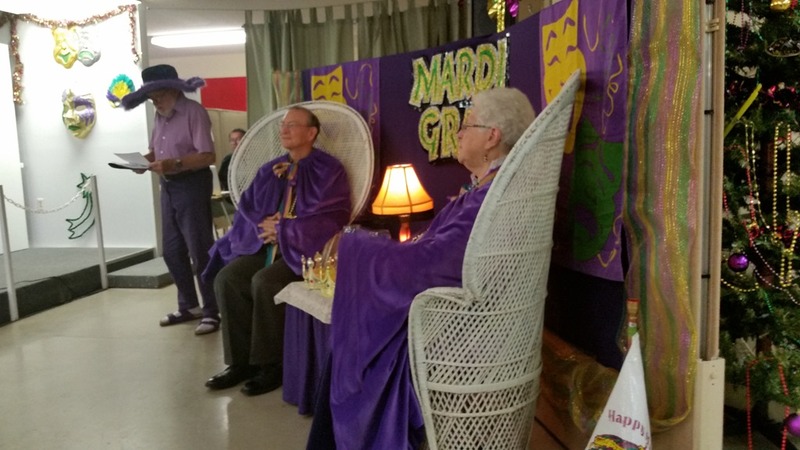 It was the Mardi Gras night when they choose the King and Queen. There is something called the “Kings Cake”, which is a cake with figurines of the a King and a Queen baked into the cake. The person who bites in, becomes the King or Queen. In this case, they passed out cupcakes. Fortunately, we did not get them, as they have duties. 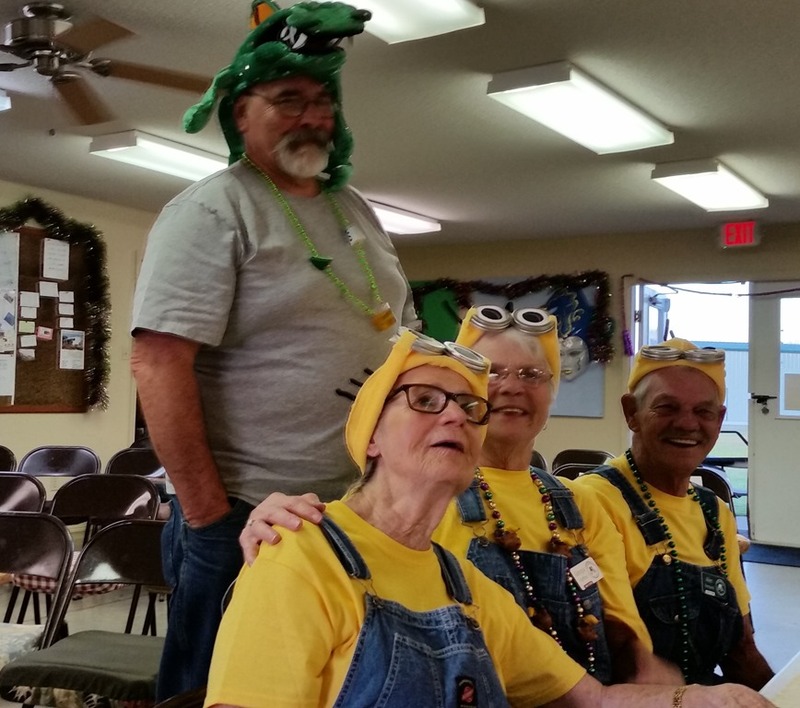 These were the folks that we sat with, Minions and Alligator hat! 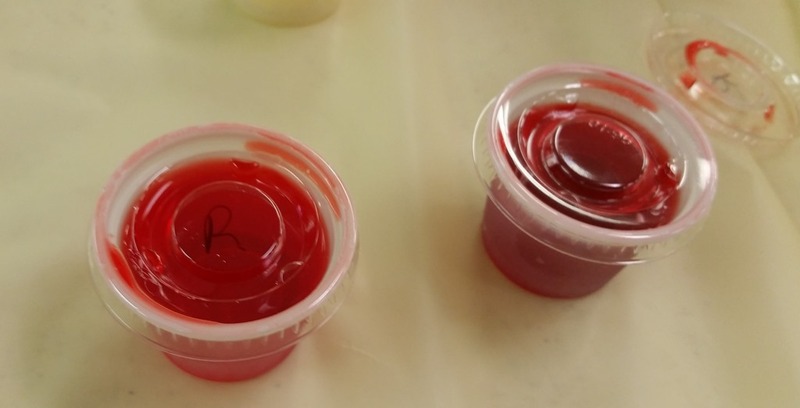 This was the first time that we have had jell-o shots. They were 3 for $1. Been there, done that, don’t have to do again! Below is the room, sorry it is a little blurry. Here are the chosen King and Queen. 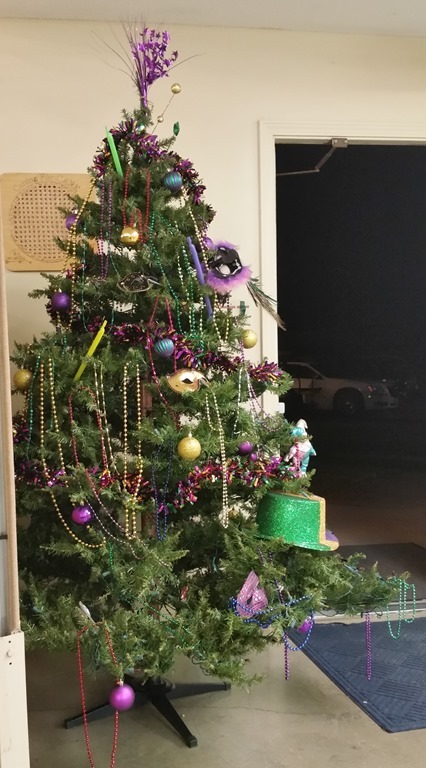 Here is a Mardi Gras tree! They did a conga type line around the room, to Louis Armstrong, “When the Saints Coming Marching In”, with everyone singing along. 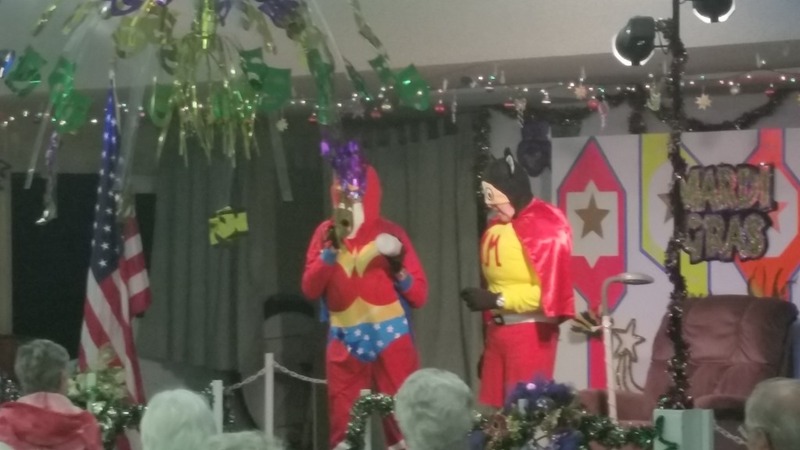 There were some very amateur skits, which, though cheesy, were fun! 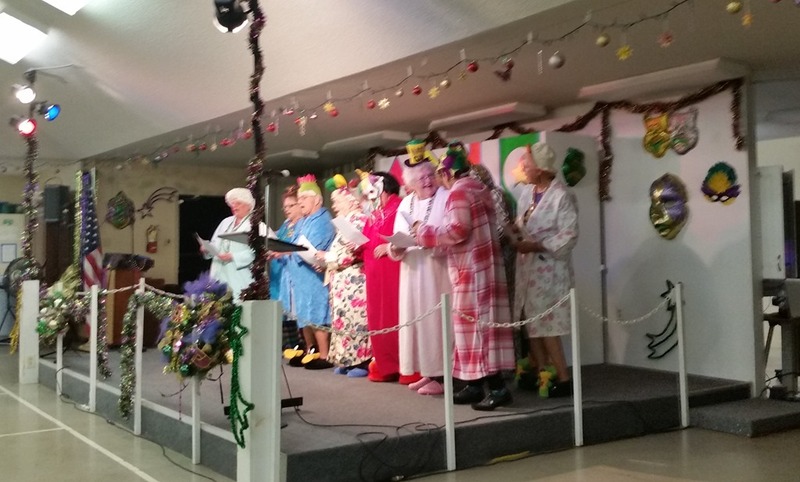 Below are the Chenille’s, they sang some very funny songs. Below was a parody of the Oak Ridge Boys. They lip sync’d to Elvira. That was a hoot! 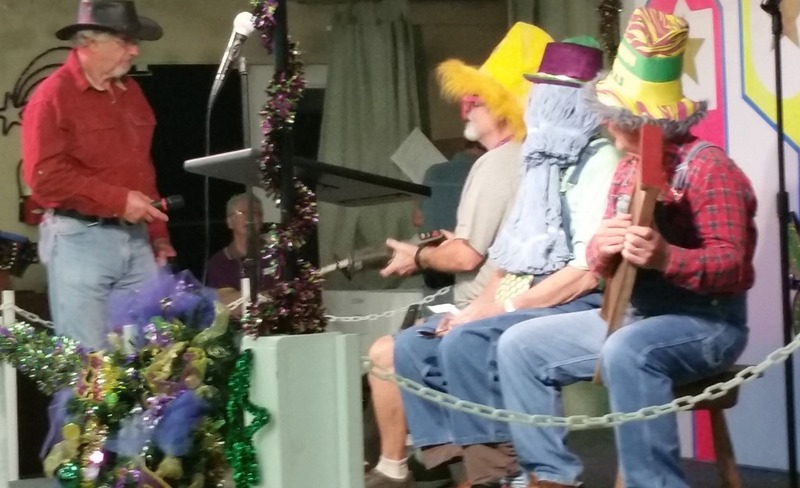 Yes, they guy with the blue on his head is wearing 3 mop heads! We were all singing along!